What if a candle would produce sound? What would that sound be like? What happens if you send this sound back to the candle? Would it start a feedback loop? Or would it do something completely different? 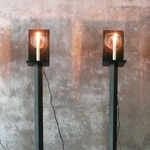 In this experiment with candles, light-sensors and speakers I researched how different systems (light, air, sound & movement) could influence each-other. 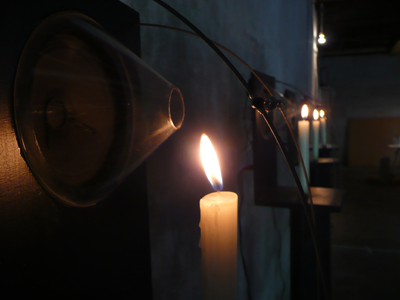 CandleSystem #2 is activated by irregularities in airflow in a space. These irregularities can be created by any movement, from walking people to an open window or door. So when someone walks past CandleSystem #2, they trigger candle-flame movement. The change in light intensity caused by the flickering candle is picked up by a lightsensor and after a conversion the change in light is sent back to the candle as sound. 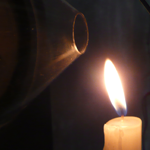 Sound causes waves in air, which make the candle move again: a feedbacksystem starts. Are you playing this instrument, or is the instrument playing itself?